Just got back from Barrage! 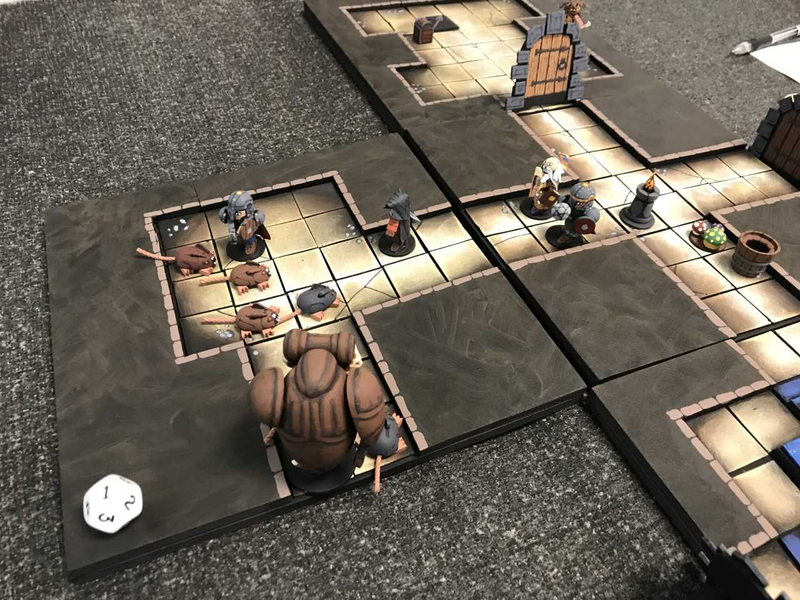 It is a two day (Friday & Saturday) local wargaming convention that focuses on historical miniature wargaming, but also has some other miniature games included as well. For example, Zeb Cook of Expert D&D fame ran a Colonials period game but involved a Martian invasion with "walkers," martians, and flying monkeys. There was also a "dinosaurs eat Nazis" game and several sci-fi games, both ship to ship combat and man vs. man Star Wars battles. So my Craftee dungeon crawl game fit right in! I ran three games starting at 9:00 am yesterday, and drove home very satisfied, but exhausted. Here are some shots from the various games in no particular order. You can't really read it, but this is the premise of the game. 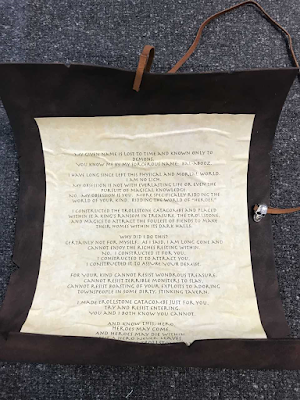 Our group of heroes have been "sitting" on this scroll for several years after finding it in some long-forgotten tomb of an ancient wizard. It describes a catacombs full of treasure and monsters, with the goal of the building of said complex to rid the world of "heroes" by baiting them into the catacombs because no "hero" can ever leave after entering. This is an important clue for purposes of winning the game in the final room. This is just thin craft foam textured by rolling balled up tin foil over the foam and then painting it with a dark brown and then a lighter brown to give it a "leather" appearance. I printed out the "riddle" on parchment paper and glued it to the inside of the foam. Then I punched a hole in the top of the foam with a hole punch and ran flexible leather through the hole, securing it with hot glue. On the other end of the leather with hot glue I attached a metal skull that goes on shoe laces as a weight to hold the scroll closed. I forgot to take a picture of this but all you do is roll the foam up in a tube shape and the wrap the leather several times around the middle of the tube shape which holds it closed. The players were able to consult this riddle throughout the game for clues. This group decided to not tempt the Kraken beast in the water and go through another opening in the room to continue their quest for the treasure. That's the Burglar in front, female Priest and Fighter side by side, and Wizard in the rear. End game for the first group of players. As I stated in the play test last month, the entire dungeon and the contents of each area is randomly determined. 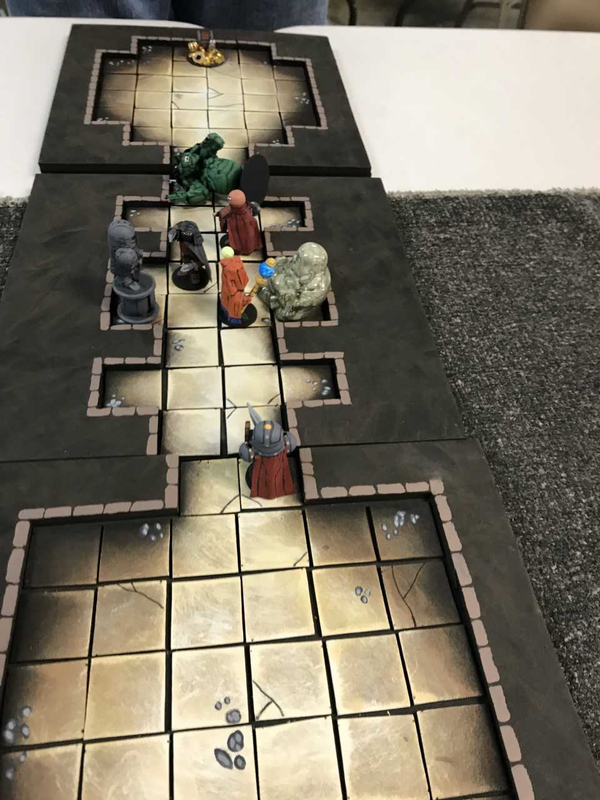 At this point in the turn, two of the heroes, the Priest and the Wizard, have entered the new area and explored. When the first hero enters the new area a die is rolled to determine how many "encounter points" are in the room. 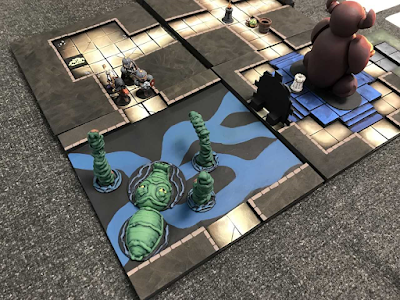 That is what the D12 there in the lower left corner of the new T-hallway that is currently being explored by the party represents. 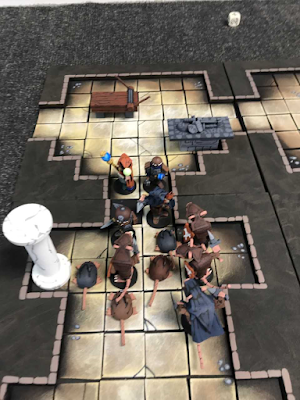 Each time a character explores, the player rolls 1D6 and reduces the number of encounter points in the area by that amount. As long as there are at least 1 encounter point remaining in an area, there is still something to be encountered in there (monster, trap, treasure, object). So in this case, the next hero who enters will also encounter something because there are 2 encounter points remaining in this area. In this case you can see that the first two heroes who entered the T intersection both encountered an object. These can be searched if desired by they can also be left alone. 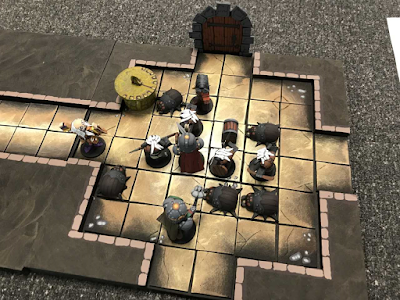 Searching results in either "nothing" or a trap or a treasure, so there is a risk-reward element to objects in the game. This is from the second game and was IMO the most exciting of the three. At the top of the picture you can see a closed doorway. The Wizard use his "Wizard's Eye" spell which if successful (and the player made her roll so the spell worked!) all things in the room are revealed and placed in the room. This is a great spell because by doing this she saw 1) that this was a dead end room which does not help the group get closer to the final treasure room, and 2) that although there was a treasure chest in the room, there was also a trap (the black spear tile placed next to the treasure chest) and a Medusa! The players were all in agreement that there was no way they were going in there! Unfortunately, the next area they entered had a lot of monsters in it! Giant rats and a Demon! And you can see that there is still one encounter point remaining in this area, which means there could be even more monsters! 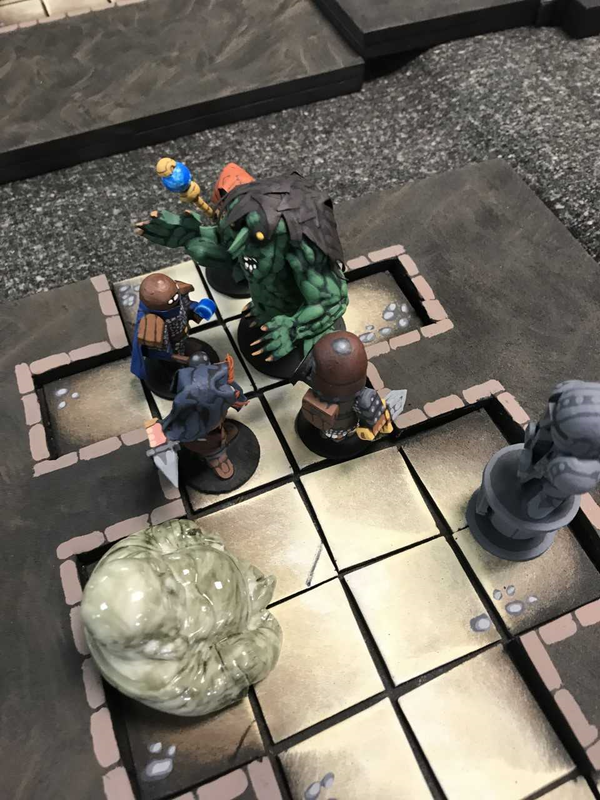 Turned out there was an object instead and the party was able to handle these monsters. This party then hit the Kraken room. They decided they did not want to try and cross and doubled back through the T intersection and into the large Idol room. You can see the unexplored opening on the right of the idol. However, by backtracking they had to still see if they used resources (food, water, torches, etc.) while moving through the rooms they have cleared already to get to that unexplored opening. This has the chance of causing the loss of resources which can eventually even cause the heroes to lose Life points. So this was a tough decision for the players (backtrack vs. test the Kraken) but this was early in the game and the heroes had a lot of resources still so they decided to double back. I think they made the correct call. 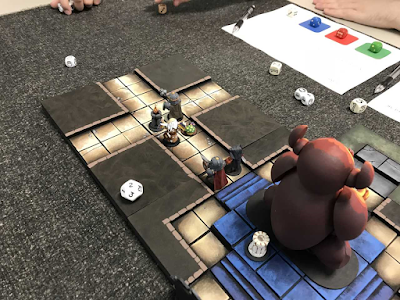 This is the second group of players again and they did run into many more monsters than the other two groups. Here they are having to fend off both a group of goblins and a group of giant beetles. The treasure chest sits in the center of the room taunting them. The sundial (sundial in a dungeon!?) is an object that can be searched if desired. This is the third group. I just liked this shot because when there are no more encounter points in an area, that means there is nothing else to come across (monsters, treasure, etc.) in that area. Therefore until the group decides to go onto the next unexplored area, they can freely move their figures anywhere they like in the explored area and do whatever they want to do. In this case, all that was in this room was a treasure chest that was trapped. 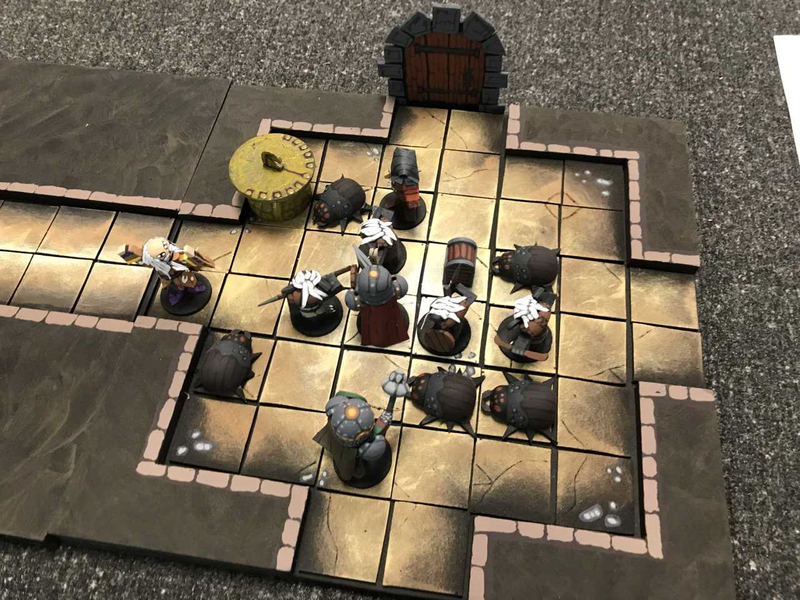 The players knew it was trapped and the other three members stayed well back from the chest while the Burglar went in to disarm the trap. She was successful! This was an interesting room because of the objects they encountered, so I took a picture. What has happened is that at this point in the turn, three of the heroes have entered (only the Burglar remains outside the new area, you can see her in the opening in the old area) and there is no encounter die on the area so everything has been discovered that is in here. Again, these are objects and may be searched by the heroes if desired. This was a nasty fight with a group of Giant Rats and Ratkin ("rat-men"). The monsters are determined randomly but I thought it was interesting that the two that were encountered in this area were both rat-themed. This third party ran into a major shortage of resources (food, water, etc.) problem very early in the game. At this point they just finished off the Giant Rats and Ratkin, but the area was a dead end. They would have had to backtrack through several old areas to get to an unexplored opening which would likely have caused some of them to lose Life because of the group not having very many resources left. They decided to look for a secret door, found it thanks to the Burglar, and revealed the next area. Oh no! It's the Kraken room! Now they have to decide to either test the Kraken or double back and likely lose Life because they lack resources. 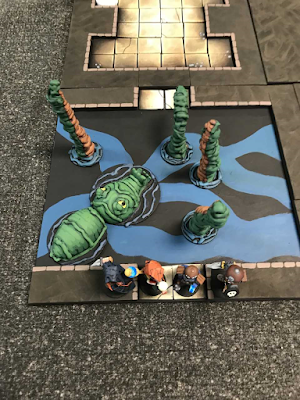 They decided to try and get through the room to the other side avoiding the tentacles (the heroes cannot kill the Kraken). Made it! 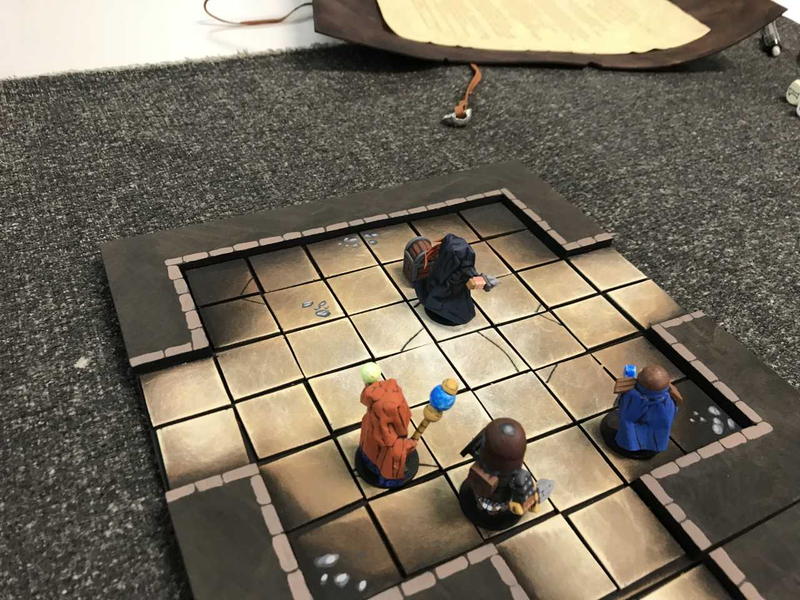 They were the first group of players to ever test the Kraken, and although the Wizard took some damage, they made it! 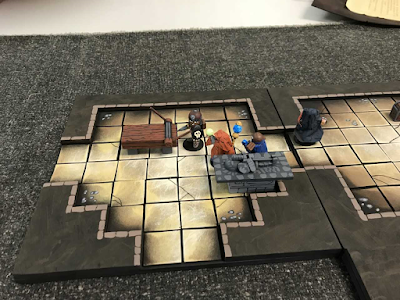 Final group's end room with the Troll. 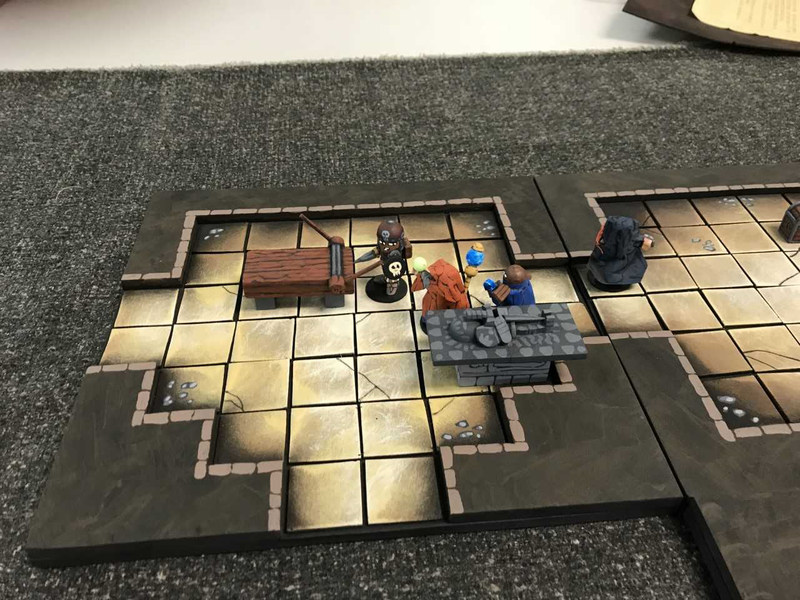 We ran out of table space so we had to move this room away from the rest of the catacombs. For the second and third group, I tried a new puzzle that is related to the riddle on the scroll. As they progress through each room, a tile drops from the ceiling. Each tile has a letter on it. Once you have all the tiles, you can spell "No Hero." 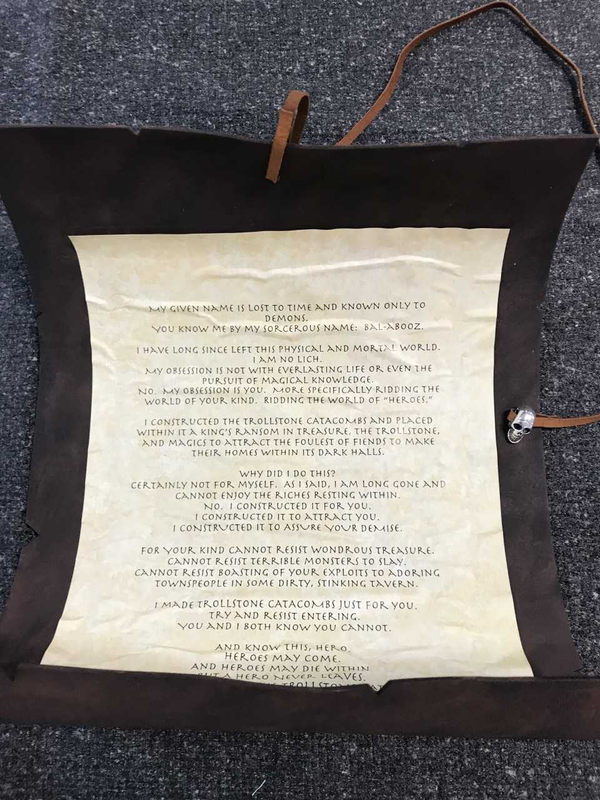 This is related to the clues on the scroll which state that "no hero ever leaves." 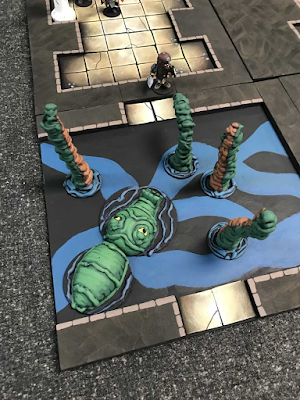 You place the tiles in that order in open spaces that are at the bottom of the Troll statue in this room (the Buddha is standing in for my Troll statue). If they do not solve the riddle, one of the party then turns into a Troll that must be slain. When that Troll is killed, one of the remaining party members then turns into a Troll. 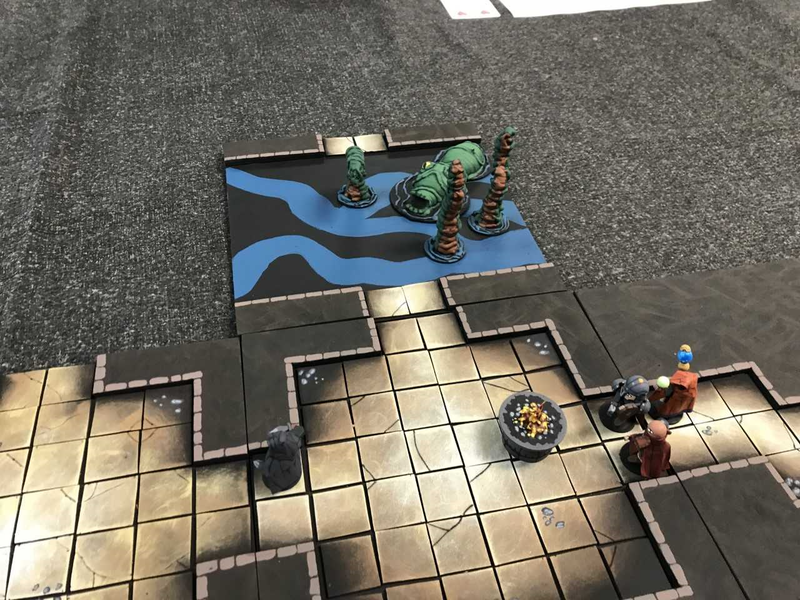 This continues until either the Troll kills the last party member, or the last party member kills the Troll. If that happens, though, that last party member then turns into a Troll. This is the curse and magic of the Trollstone Catacombs that keep it all going. However, if you put the letter tiles into the bottom of the statue in the correct order to spell out "no hero" the party can escape, with the treasure. In the Troll's sleeping chamber is a huge pile of treasure that I jokingly said had a sign sticking in it that said "401K". The Barrage! convention was as fun as always. The Hawks put it on every year, they are very organized and the community center space they use is reasonably priced, which means the fee for attending is very reasonable, and the space is larger even than they need so there is plenty of space and it is not cramped at all. There are some game vendors there, they provide food you can buy if you get hungry while playing, and are just a good group of gamers. I think the three games were successful and I'm pleased with how it went. I noticed some ways to make the game more challenging, but this is a convention game and I wanted the players to be successful and have fun. I'm already looking forward to next year!